The Volta Region is an area of extraordinary scenic beauty. The rolling hills and valleys, rocky outcrops overlooking Lake Volta, and lagoons, rivers and waterfall make for one of nature’s most attractive gift to Ghana. The region stretches from the coastal plains on the Atlantic coast right up to the arid lands of the north, and climatic conditions can vary tremendously. From the coastal plain, fringed by sun-belt, where Mt. Afadjato at 885m is the highest point in Ghana, to the arid savannah of northern Ghana, you can experience almost every tropical climate in West Africa. 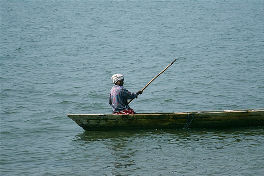 This region is also dominated by the River Volta and Lake Volta, on its western flank. The lake is a source of power, and much or the water for the region; it is the water highway to the north, a great fishing lake as well as a popular recreational area. Although some waterfalls may be seasonal, all are set in attractive wooded or mountain settings. 1. Wli Falls – 20km from Hohoe, in the Wli Natural Reserve. 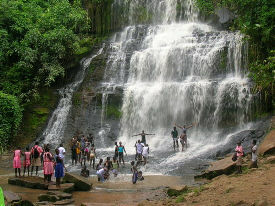 This waterfall is becoming very popular in the West African sub-region. It is perennial as water cascades throughout the year. It is located at the edge of the Agumatsa Wildlife Sanctuary, which has hundreds of fruit bats and a few monkeys and antelopes. The water falls from a height of about 1,600 feet. 2. TagboFalls – near Liati Wote. This waterfall is incredibly beautiful. It flows from the Ghana-Togo mountain range. It is covered by green vegetation and has cages forming at the sides. It does not have a big plunge pool as the Wli one but is beautiful in its own way. Visitors are charged a minimal fee. 3. TsatsaduFalls – 10km from Hohoe. There are seasonal waterfalls at Alambo near Leklebi Agbesia; Likpe Todome and a few others. 4. TagboFalls – near Liati Wote. This waterfall is incredibly beautiful. It flows from the Ghana-Togo mountain range. It is covered by green vegetation and has cages forming at the sides. It does not have a big plunge pool as the Wli one but is beautiful in its own way. Visitors are charged a minimal fee. Every available evidence points to the fact that the Nkwanta district is very rich in game and wildlife. There are heads, skins and bones of animal that have been killed by hunters, especially at Kue. The heads include those of the buffalo, various types of monkeys, hyena, red-river hog and variety of birds. Consequently a national park, Kyabobo National Park, has been created near Kwanta. It is noteworthy to state that the Togolese have a national part at the other side of the Ghana-Togo ranges called Parc National de Fazao. 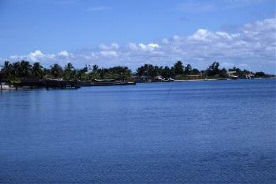 The estuary is an area of great scenic beauty, with river and ocean beaches, and picnic spots shaded by palm trees. The sand bars are the nesting grounds for sea birds, and endangered species of turtle are still found here. Nestled in the heart of the region (43km South of Hohoe and less than 200km north of Accra) lies the beautiful village of Tafi Atome. Tafi Atome is surrounded by an indigenous tropical forest with very high floral concentration. In this forest, one could find the endangered, playful and rather sacred True Mona Monkeys. Believing the monkeys to be messengers to the gods and their protectors, the chiefs and people of Tafi have been protecting them for the past 200 years. Hundreds of speicies of monkeys, including the nearly extinct Mona, make the dense tropical forest around Tafi Atome their home. 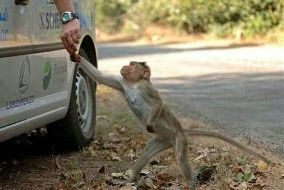 The monkeys are friendly and playful and venture into the village daily. Tradition does not permit people to kill or harm them. The Ramsar Site is 1200km2 including the eastern bank of the Volta River and the Togo boarder. The surface area of the principal lagoon and the seasonal mud flats is over 300km2. The lagoon supports the largest inland fisheries within the coastal zone of Ghana.Other principal economic activities within the site are shallot farming through irrigated agriculture, and mats, hats and fan weaving industry from reeds found along the banks of the lagoon. These products earn the natives millions of cedis in income. 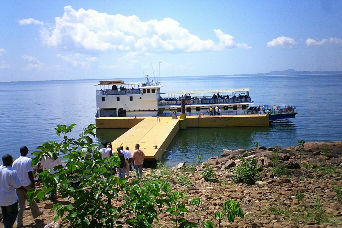 Some of the mats are exported to neighbouring Togo. From Accra, Kalakpa Resource Reserve can be reached through Juapong on a branch off the main Accra to Ho road. The Ho to Abutia Kloe road through Sokode can access the reserve.The Resource Reserve with its administrative headquarters at Abtia-Kloe in the Ho district of the Volta Region has an area of about 325km². The reserve is located between the Abutia and Adaku traditional areas in the typical Guinea Savanna vegetation zone. It has a spectacular combination of forests on the hills found in the middle of the reserve and along drivers and grass on the plains of the reserve. It is one of the few places in the region where indigenous animals associated with the vegetation can still be found. 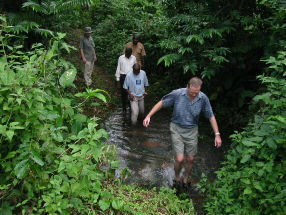 Prior to the establishment of the reserve, the area use to be the sport hunting grounds for expatriates, mainly Italians, Greeks and Germans resident in Accra, Akosombo and Tema.The reserve abounds with the following animals; Red-riverhog, Buffalo, Bushbuck, Waterbuck, Kob, Oribi, Black Duiker, grey duiker and Red flanked duiker. The common monkeys found are Baboon, Patas monkey, green monkey, spot-nosed monkey with Black and White Colobus being present but rare. 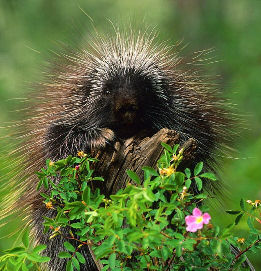 Other small mammals include rodents like Giant rat, Grasscutter, Crested porcupine and Pangolins. Bird fauna in the reserve is also rich (no of species). Apart from the rich wildlife diversity of the reserve, other sites of attraction, which will be useful to tourists, include, the scenic beauty of the numerous hills in the reserve (Zitoe, Koffitoe, Kadanga etc.) and the higher density and abundance of Borassus palm in the reserve. Kadanga one of the hills is believed to be the ancestral home of the people of Abutia. Accommodation for visitors and catering services are not available at the reserve headquarters but excellent services can be obtained at Woezor Hotel in Ho that is only about 20km away from the reserve. There are no roads in the reserve; therefore only foot safaris can be done. Small scale camping can be permitted at Zitoe and Agordeke camps with one's own camping gear. Agumatsa wildlife sanctuary is located in the Hohoe district of the Volta Region on the Togo-Buen ranges. The area boasts of the most spectacular geographical feature in the district. An hour's walk through cool shades of trees will lead you to Ghana's highest waterfalls. The beauty of the falls is enhanced not only by the towering face of the gorge but most impressively by the several thousands of fruit bats clinging to its sides. This waterfalls which consist of a series of four falls and two cascades descending an amazing 600m height is one of the perennial falls in Ghana open to visitors throughout the year.To get to the base of the falls from Wli-Agorviefe one has to walk on a path which crosses the meandering Agumatasa River eleven (11) times on locally made log bridges. At the base of the falls one will enjoy the beauty of nature in a cool microclimate. 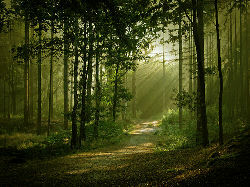 In addition the forest, butterflies of varies colors and other wild animals make the area significant for conservation. 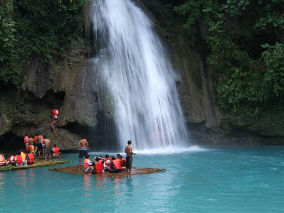 The falls also plays an important part in the cultural life of the communities around it. The people regard it as a fetish protecting them in all walks of life. It is believed among the natives that it has power of curing barrenness in women. The chiefs and people of Agotome traditional area, a few kilometres east of Ho, who are indeed Ga-Adanbges, celebrate their annual Kente festivals in August every year. This is a unique festival by all standards. The Ago time people claim they introduced the art of Kente weaving to present-day Ghana and consequently have been marking this event with a colourful festival. 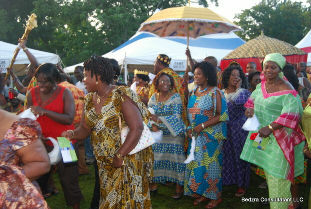 The festival culminates in a durbar of chiefs and subjects and various types of Kente cloth are put on display. A unique aspect of the festival is Kente-weaving competition and one that brings about the best in crowned. In the evening of Saturday, Miss "Agbamevor" (Miss Kente) INS selected. This unique festival attracts thousands of people from far and near including tourists. As the name implies, the festival is centred on the harvest of rice so it is a harvest festival. 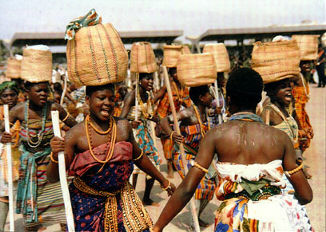 It is celebrated at Vane, the traditional capital of the Avatime people. It is celebrated in the last week of November to December. It does attract a number of tourists. The people to Avatime, who migrated from the Ahanta areas of the Western Region, fought the original people of the area they now occupy, and this is reflected in their drumming, dancing and singing. 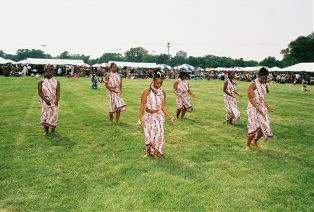 In October, any of the four communities forming the SASADU i.e. Saviefe, Akrofu, Soviet and Alavanyo (on rotational basis) celebrate what is now known as the SASADU festival. It is a festival of pomp and pageantry meant to rekindle the fraternal relationship that exists between the four communities who are said to be of the same stock. A grand durbar of chiefs crowns the festival. In every February, the chiefs and people of the Agave traditional area celebrate their annual Dzawuwu festival at Dabala, their chief commercial centre. It is essentially a thanksgiving festival where special portions foods are sprinkled to the gods. It also commemorates the bravery of the Agaves of the past who fought and won several wars. It is the time to pay tribute to departed ones and to pour libation for the people to renew their loyalty to their rulers. It has an impressive durbar of chiefs to climax it. Drumming and dancing feature prominently. Two weeks after the Anlo-Ewes celebrate Hogbetsotso festival, their cousins, the Some-Ewes celebrate their Keta-Sometutuza at Agbozume, their traditional home. This colourful festival of pomp and pageantry is rounded off with a grand durbar of chiefs and their subjects on a Saturday. Chiefs pay homage to their paramount chief and renew their allegiance. The Some area is noted for Kente weaving. The chiefs and people of Dofor Traditional Area in North Tongu District have as their major town Dofor Adidome and celebrate their annual Ayimagonu festival in November. 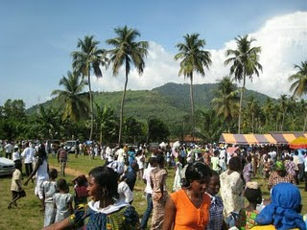 Dofor Adidome, a few kilometres from juapong, is the Festival home. It is a festival of pomp and pageantry, which culminates in a grand durbar of chiefs where the chiefs sit in state to receive homage from their subjects. The mode of celebration differs slightly from one traditional area to another. In mid- September to September ending, the chiefs and people of Asogli State (Ho) and surrounding areas such as Sokode, Abutia Klefe and Akrofu celebrate their annual yam festival. This is essentially a harvest festival. Cooked yam is sprinkled at the various shrines. This is done before any human being is allowed to cook and taste the real yam. There is usually a grand durbar of chiefs where the chiefs sit in state to receive homage from their subjects. The mode of celebration differs slightly from one traditional area to another. In November, the chiefs of Gbi (North) Hohoe areas and Gbi (South) Peki areas celebrate their annual festival rotations from Hohoe to Peki. It is a very colourful festival of pomp and pageantry. Chiefs are carried in palanquins amidst drumming and dancing. This festival is to commemorate the exploits of the Gbi-Ewes of old. New development projects are initiated. It marks the period of family re-union and to attract thousands of people from far and near. The festival is normally celebrated in November. The chiefs and people of Warowaro who are Akans celebrate their new revived festival called Akwantutenten. 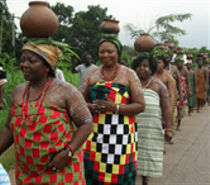 This festival is to commemorate the exodus of the people of Warowaro from Ashanti-land to their present abode. It is celebrated like most Akan festival culminating in a colourful durbar of chiefs on a Saturday. Chiefs sit in state to receive homage from their subjects. Thousands of citizens and other Akans throng the town of Worawora to give of their best. The festival, a major crowed puller, involves a pilgrimage to their first settlement up the hills overlooking the hills at which foot the present settlement is located. 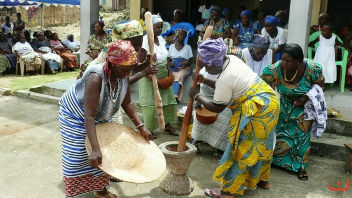 The chiefs and people of Adaklu traditional area celebrate Glimetotoza to commemorate their exodus from Notsie in present-day Northern Togo to their present abode. During the celebration, the bravery for their ancestors is put on display in forms of war dances, songs and drums. As usual, a grand durbar of chiefs of the Adaklu traditional area, encompassing several settle is held. The chiefs and people of Mape in North Tongu District celebrate their annual Apenorto Festival. It is a colourful festival where during the durbar of chiefs, the people put on their best of regalia for general merry-making. It is also the period to take stock of the previous year's activities whilst development plans are initiated. Wli Falls are situated in the heart of a tropical forest, 20km from Hohoe. 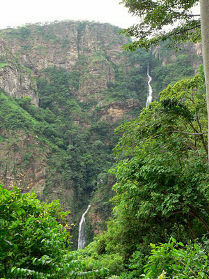 Wli is the highest waterfall in Ghana and is fed year-round by the waters of the Agumatsa River. Reaching the falls is fun and adventure-filled. You must cross 11-log bridges which span the meandering river before arriving at the falls. Besides the spectacular view, your reward is the brisk, refreshing water which is great for swimming and makes an excellent natural cooler for your beer. Thousands of bats make their home among the cliffs which surround the falls. If you are coming form Accra, the drive to Wli takes about 3 hours.